I must have come across Forever, or a Long, Long Time on my hunt for books that have characters who are adopted. QotB: Think back to your childhood. What kinds of origin stories did you make up to explain things you didn’t understand? The bulk of my synopsis is actually in the sticky note review, so I’ll just leave you with that. 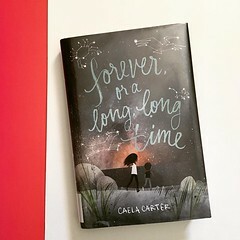 #bookaday Forever or a Long, Long Time by Caela Carter. #SNRtbs Fabulous MG novel about defining family and finding history. MC, Flora, and her brother Julian don’t believe they were born, but that they potentially come from a myriad of places. This fabrication of origin stories is something I’m learning about as we go through the adoption process. I think this a story for adult readers as much as it is for middle grade readers. You’ll fall in love with Flora. I promise. Click here for more Sticky Note Reviews, or follow #SNRtbs on Instagram.